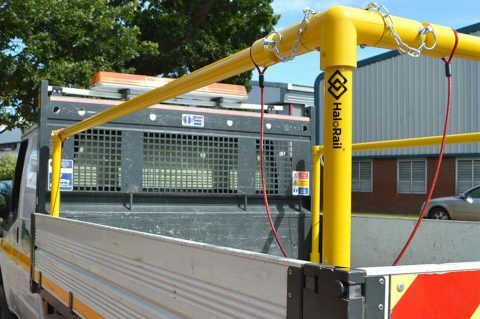 HaloRail® is our innovative safety rail for Dropside & Tipper body vehicles. It has been designed to help prevent falls from vehicles, whilst at the same time being lightweight and functional. Why do we need a new safety rail? The HSE figures suggest that each year nearly 2000 people are injured by falling from vehicles, causing great distress and in some cases, loss of livelihood. Whilst heavy goods vehicles are often fitted with systems to prevent falls, the light commercial vehicle is often overlooked, yet these are easier vehicle beds to get onto and therefore pose a higher risk of a fall. 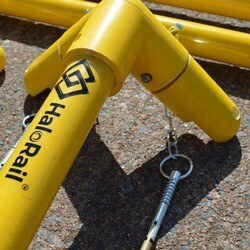 Our new HaloRail has been carefully designed to not only provide a strong safety rail, but also to have removable side and rear rails for easy loading of large items. Each of these rails have a safety cable attached to prevent them from being left by the roadside, or falling off if not properly re-attached. Each rail is locked into position with a simple sprung loaded pin which is also secured so it also cannot be left behind. It’s GRP construction means it is also lightweight so has a minimal impact upon the vehicles’ payload, and has little or no scrap value. It’s yellow colour also means it is highly visible!